Kelechi Iheanacho scored his first Leicester goal of the season in a Carabao Cup 4-0 win over Fleetwood Town played on Tuesday, August 26. 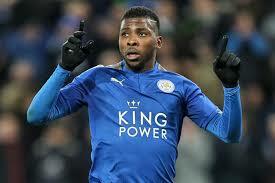 Kelechi Iheanacho has finnaly replicated his fine form for Leicester City during pre-season where he scored in friendly games against Valencia, and French Ligue 1 outfit Losc Lille. The 22-year-old has however been unable to find the net for the Foxes in their opening three Premier League games against Manchester United, Wolverhampon Wanderers and Southampton. The Nigerian international however opened his account against the lower league side just as he did last season. Leicester City took a first half lead through goals by Christian Fuchs and Vicente Iborra as they went for the break. Upon resumption for the second half Iheanacho scored Leicester's third of the game when he converted a cross by Marc Albrighton. The win was sealed by new recruit Rachid Ghezzal as the Foxes coasted to the next round of the competition. Iheancho will hope to continue his good form when Leicester City host Liverpool in their next Premier League encounter scheduled for Saturday, September 1 at the King Power Stadium.